« What does a “75% Chance of Rain” mean? Reading took about a week and 1/2. It was enjoyable to digest the stories over the course of several days. Structure: The first part visits application of the checklist in the medical field, Gawanda goes on to show how checklists are used in massive construction projects and by pilot. He brings in some interesting research sources about investors using checklists and then brings the book back around to talk more about the hard work of getting organizations to adhere to checklist use. Thesis: Don’t underestimate the benefits of a checklist. I’ve been resistant to checklists in the past. I thought they would just take more time I didn’t have. But now the statement, “required for success” resonated with me because now I can how the importance of work I do needs to be completely error free and what I truly do not have time for is going back over my work to repair mistakes. It also makes me wonder what the checklist could be for a helpful book recommendation or an insightful analysis. Very encouraging to me as I’ve started to apply checklist processes in work. Knowing when it is all falling apart, and the ground starts shaking, it does not mean it is not working. It’s part of grappling with the complexity of moving from theory to application. One of my favorite points of the book. It provides great points for how checklists, rather than draining the humanity out of process, helps to sap the drudgery out of a process and automate it. This leaves more space for creativity and improve. Just like having methodical way for cleaning and stocking a kitchen leaves more mental space for experimenting with new dishes. What is one process in your personal or professional life that would benefit from a checklist? Post it in the comments, and we can talk about. 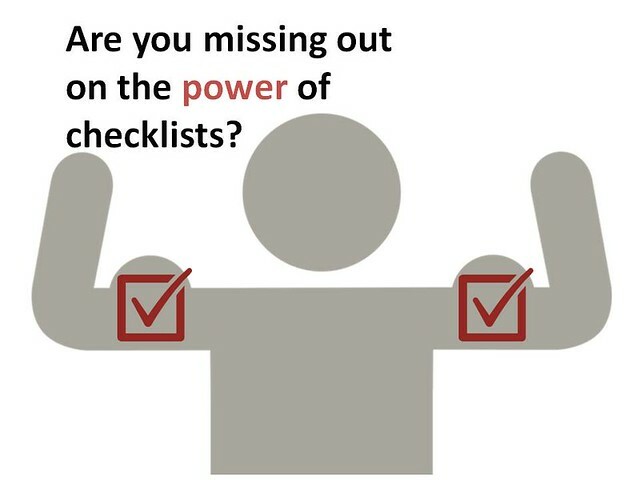 I’d love to have a conversation about how we can use checklists to get more done.